The mid-1910s saw an explosion of people driving unlicensed cabs. They were called jitneys (slang for a nickel, which was also what they typically cost) and cities across the U.S. scrambled to regulate them. Today, cities around the world are struggling to regulate modern-day jitney coordination companies—ride-sharing apps like Uber and Lyft. But unlike the ragtag cabs of a century ago, the modern day jitney company is well-financed, and plans on throwing plenty of money around to make sure it’s not regulated out of existence. Southern California was the birthplace of the jitney, and it’s also where regulators fought hardest to outlaw their use. But aside from places like Los Angeles (home of the first jitney), cities like Kansas City saw the jitney arrive seemingly overnight. With the rise of so-called ride-sharing companies like Uber and Lyft in the past couple of years, there’s no doubt history will write a similar “overnight” narrative for the arrival of the 21st century’s answer to the jitney. Born in Los Angeles in mid-1914, the jitney attracted little attention outside of southern California until January 1915. Then in the space of a few weeks, or sometimes a single day, jitneys by the hundreds crowded onto the downtown streets of western cities in the United States and Canada. In Kansas City, for example, during a two-week period the number of jitneys jumped from zero to two hundred cars, carrying nearly 25,000 passengers a day, and that was only the beginning. Two weeks later, the number of jitney patrons in Kansas City reached 45-50,000 a day. Most cities weren’t sure what to do. There were a number of competing interests, each with their own solution to the jitney explosion. Some cities tried to regulate the chaotic industry that had sprung up without warning. After a few years, Los Angeles simply outlawed the jitney due to the amount of revenue it was losing as fewer people were taking the city’s railways. But other cities tried a different approach. Kansas City, for example, appointed a jitney inspector in 1919. The first job for this city official was to make sure that the cars themselves were safe. Jitney drivers would often modify their vehicles with enormous contraptions on the back to fit more paying customers. Under the headline, “Safer Travel in Jitneys” the Kansas City Times in 1919 proclaimed that it was now safe to ride in jitneys throughout the city. The boding of the jitneys has opened a new source of patrons to the drivers. Many persons, principally women shoppers, did not ride in the jitneys because they feared personal injury for which there would be no compensation. Now all passengers in jitneys will be assured of financial protection. This added cost was tough for the jitney operators to absorb. But by the early 1920s, the jitney drivers had even harder obstacles. The political winds were shifting in Kansas City and in 1921, the city began regulating where the jitney drivers were allowed to operate. Any streets near railways were suddenly off limits. And the railways were there for a reason—that’s the path that provided the greatest route from where people were to where they wanted to go. 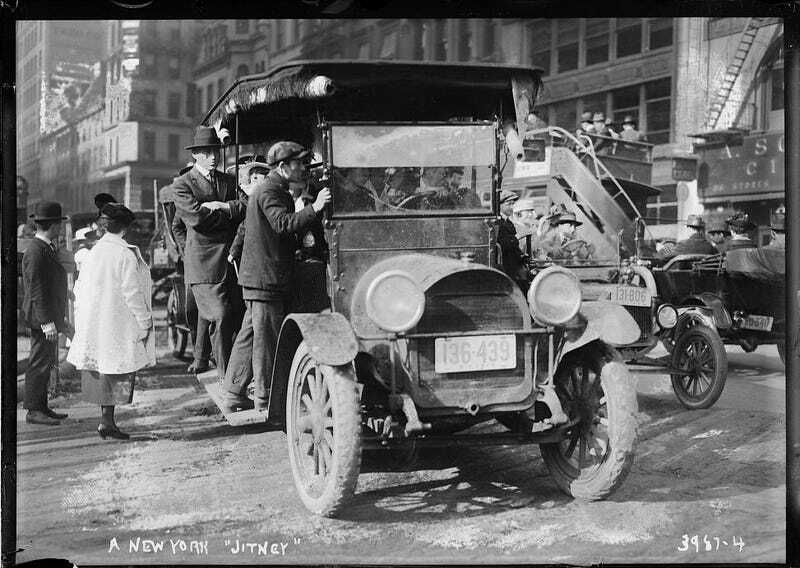 By the end of the 1910s, the jitney was no longer thriving and most major cities had simply outlawed their existence. For others like Kansas City, it took a few more years for entrenched transportation companies like those operating the railways to do away with the jitney almost entirely. Despite the loose coalitions that were formed by jitney operators, they didn’t have a strong national unified front to blunt the attacks on the city level. Just as services like Uber’s ride-sharing are hailed today as the underdog and champion of the working class, so too were the jitneys positioned as the great path to reform in the 1910s. The ride-sharing industry is at the fight or die crossroads in its historical arc. They’ve purchased the weapons to fight effectively and are determined not to go the way of the jitney. But once companies like Uber win, what next? As many commentators, like Farhad Manjoo, have pointed out, the modern jitney cab is now a commodity. People don’t really see a difference between an Uber or a Lyft ride. In fact, drivers are often equipped with multiple phones sometimes working for half a dozen companies at once, as you can see in the photo below. Uber needs to establish itself as the dominant company in the market in order to stay alive long term. Because once the regulatory battles have been won, the real fight begins. In fact, Uber has already started to wage their version of ride-share guerrilla warfare. Under the internal codename Operation SLOG, Uber is ordering and canceling the rides of competing companies and attempting to poach employees through coordinated schemes. And once a given company “wins” it’s a pretty safe bet that they’ll begin to act like any of the legacy transportation companies. Which is to say, you can assume that a company like Uber will embrace regulations and try to keep the so-called new disruptors at bay. This time, we’ll get to see the timeline where the jitney cabs won. And I’m guessing it won’t necessarily be everything its boosters were hailing it to be.